The United Methodist Committee on Relief (UMCOR) is providing emergency funds to the New Mexico and Rocky Mountain Annual Conferences to help them with their initial response to the wildfires raging in New Mexico and Colorado. At the time this update was written, more than 181 homes in Northern Colorado (like the one in the image to the right) have already been destroyed in the fires that continued to be fueled by high winds. 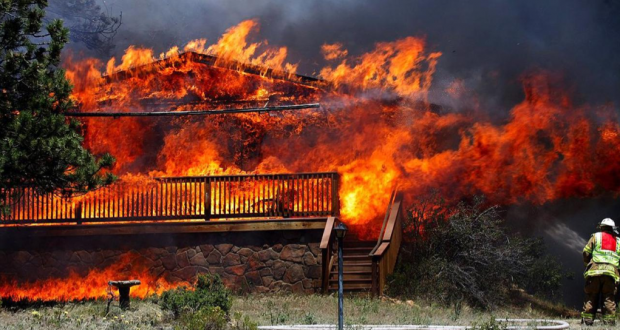 In the Gila Wilderness, the largest fire in New Mexico’s history has destroyed 435 square miles, so far. In Little Bear, some 225 homes were affected by the blazes. If you'd like to help support UMCOR’s effort to provide help in the wake of disaster, you can give through your local church or directly to UMCOR by clicking on the button below and giving to US Disaster Response, UMCOR Advance #901670. CTC churches should direct any donations received to the CTC Service Center via the remittance forms found in the Connectional Mission Giving section of the Finance tab of ctcumc.org for distribution to UMCOR (look for UMCOR - USA) or designate gifts received for "Colorado Fires." If you have questions regarding donations, please contact Rev. Dawne Phillips (dawnephillips@ctcumc.org) or David Stinson (davidstinson@ctcumc.org) at the CTC Service Center (817-877-5222).